Today we TrailBlazers met with our staff and faculty at Penn State Brandywine to update them about Fair Trade, what our campus has been doing, what tasks we still hope to accomplish, and what kind of community involvement we need to further the movement. It was a successful meeting, and we were happy with the kinds of questions asked, like how can Fair Trade be implemented into classes, how do we go from education and awareness to action, where do we see our campus a few years down the line, and so on. The meeting gave us a lot to think about in terms of sparking passion in the community and keeping the momentum going. Our hope is to make the Fair Trade movement on campus not only a student initiative, but one that brings the faculty, staff, and administration into the fold as well. We discussed how student clubs on campus have been mostly student oriented, and while a Fair Trade club is a good idea, we want to include everyone on campus. In essence, by bringing Fair Trade to Penn State Brandywine, we hope to change the culture in a positive, more communal way, so that the student body and the faculty, staff, and administration, have something in common to gather around. That kind of togetherness is already starting to bud, and from the meeting today, it is easy to see how passionate our community is becoming. It’s hard to say where this will be in several years, even a year, but I can’t think of a better rallying point than Fair Trade. Today, the Fair Trade TrailBlazers were joined by some special guests for a great lunch and conversation – Spring 2012 Laboratory for Civic Engagement Communications Intern Zanya Stephenson, Chancellor Sophia Wisniewska, and donor David Rosenberg. As members of the first Rosenberg Civic Engagement Course, the TrailBlazers shared their experiences learning about Fair Trade, connecting with people and organizations outside of the campus to inform their learning, and the collaboration and leadership necessary to get approved for Fair Trade University status. The students also discussed how to sustain and grow these efforts to continue education and awareness of the Fair Trade movement. And we have to make mention of dessert, homemade by Dr. Guertin – Fair Trade chocolate chip brownies, made with Fair Trade certified sugar, brown sugar, vanilla, and chocolate chips! Pictured above, front row, left to right: Sara Neville, Zanya Stephenson, Sarah DeMartino. Back row, left to right: Chancellor Wisniewska, Louis Donaghue, David Rosenberg, Dr. Laura Guertin, Bryan Marton. Thanks again for the help from Jason Mandell and Jeff Beecher of Professor Donna Talis’ English 419 class for their press release, recruitment letter, and overall support for Fair Trade. 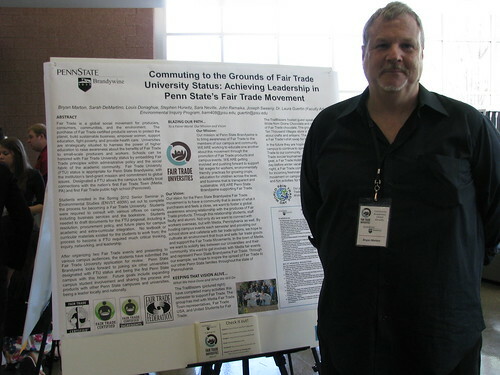 The Fair Trade TrailBlazers presented a poster at the campus undergraduate research symposium EURECA on April 17, 2012. The abstract and poster were a collaborative effort, with TrailBlazer Bryan Marton (pictured below) representing the group at EURECA. The text of the abstract is included in this post. Click here to view a PDF of the poster. Fair Trade is a global social movement for producers, consumers, communities, and the environment. The purchase of Fair Trade certified products serves to protect the planet, build sustainable business, empower women, support education, fight poverty, and provide health care. Universities are strategically situated to harness the power of higher education to raise awareness about the benefits of Fair Trade to small-scale producers and workers. Schools can be honored with Fair Trade University status by embedding Fair Trade principles within administrative policy and the social fabric of the academic community. 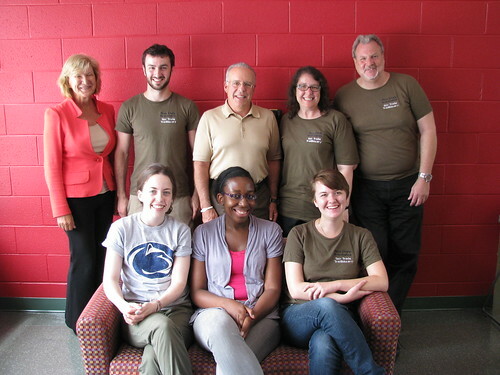 Fair Trade University (FTU) status is appropriate for Penn State Brandywine, with the institution’s land-grant mission and commitment to global issues. Designated a FTU allows the campus to solidify local connections with the nation’s first Fair Trade Town (Media, PA) and first Fair Trade public high school (Penncrest). Students enrolled in the Spring 2012 Senior Seminar in Environmental Studies (ENVST 400W) set out to complete the process for becoming a Fair Trade University. Students were required to consult with various offices on campus, including business services and the bookstore. Students needed to draft documents for the FTU proposal, including a resolution, procurement policy, and future plans for campus academic and extra-curricular integration. No textbook or curricular materials existed for the students to work from; the process to become a FTU required much critical thinking, inquiry, networking, and leadership. After organizing two Fair Trade events and presenting to various campus audiences, the students have submitted the Fair Trade University application for review. Penn State Brandywine looks forward to joining six other universities designated with FTU status and being the first Penn State campus with this honor. Future goals include expanding campus student involvement and sharing the process and products with other Penn State campuses and universities, being a leader locally and nationally. Jack, Sarah and I had a great time talking to an attentive Business (Management) class at Brandywine, today. Thank you, Dr. Godshalk, for letting us come and talk to your class. ENVST 400W, Senior Seminar in Environmental Studies, has been selected by Penn State Brandywine’s Laboratory for Civic Engagement as the first Rosenberg Civic Engagement Course. The course focuses on the interdisciplinary subject of Fair Trade. To honor and recognize the significant contribution David and Marjorie Rosenberg have made to assist with coordinating and further expanding the civic engagement efforts at Penn State Brandywine, the campus will identify one course each semester (fall and spring) and designate that course the Rosenberg Civic Engagement Course. The course goes above-and-beyond a standard campus civic engagement offering and challenges students to the highest levels, aligning with the Laboratory for Civic Engagement’s mission of citizenship, scholarship, and leadership. The course is selected by the Laboratory Coordinator and the Rosenberg Professor for Leadership and Innovation. Dr. Laura Guertin, Associate Professor of Earth Science and instructor for ENVST 400W, is thrilled with the honor. “The students certainly have earned this recognition,” she states. “This course demands that students step up as leaders in moving forward the effort to establish Penn State Brandywine as a Fair Trade University. Students have been in conversations with staff on campus, alumni through email and Skype, and have hosted speakers from Fair Trade Towns Media and Fair Trade Towns USA. The students have developed mission and vision statements of Fair Trade on campus, and they will be hosting two Fair Trade events later this semester.” Dr. Guertin encourages everyone to come out for the Fair Trade t-shirt exchange and seminar by Divine Chocolate.